What was the first question Senate Banking Committee Chair Shelby asked Fed Chair Yellen at the Semiannual Monetary Policy Hearing? Guess again – it was about measuring inflation. Yet, all the averages mentioned hide the same secret lurking in the data. What strikes shoppers as silly is the economic assumption that inflation averages parallel most individual products. People paying bills already know that the average inflation rate is as misleading the unemployment rate. Price for electricity is up, garden tools are flat and gas is down. Inflation is needed for overall demand to rise. Not really. After 3 decades of growing demand for some product groups, these products still have restrained prices. Sophisticated monetary policy held down inflation expectations. Maybe not. Shoppers might just have considered the reality of falling prices for many products. These assumptions might linger as correlations in some economic models, but no longer reflect reality. Policy-makers can: more closely watch individual product price and quantity purchased; adjust monetary policy for a world where – on average – demand increases as price decreases; and consider how fiscal and regulatory policy play a larger role in a less supply-constrained world. Investors can: ease their fear of average “deflation,” and evaluate company revenue by product type price, quantity and exchange rates. A shoreline rip tide illustrates the growing split in prices. Viewed from the surface, water appears to be going toward the beach – inflation. Now here’s the split — since 1981, many product prices have been decreasing — rip tide away from the beach. You see decreases every day – electronics, communications, clothing, shoes, kitchen appliances and more. Yet, these price decreases have been hidden by price increases in health care, education, financial services and others. Plunging gas prices recently revealed the decreases – but, for decades, decreases have been there — just below surface averages. The price-quantity time track pictured below expands on “Is this the Fed’s inflation trap?” to focus on some decreasing price products in the rip tide. 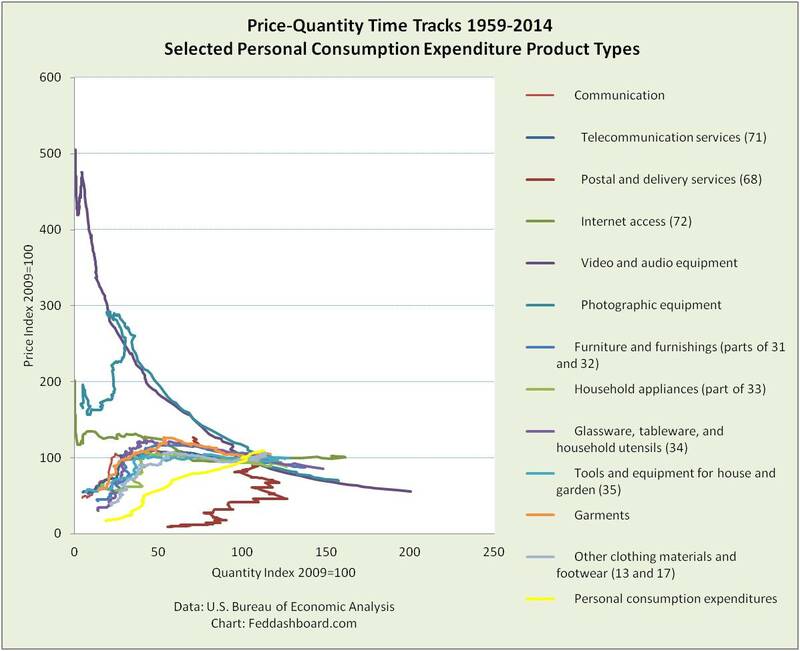 Video and audio equipment and Photographic equipment shift to exponential technology economics and race down a power curve as prices fall and purchases expand. Another group of products responds by flattening. PIPE Factors (mostly globalization and technology) describe these moves in a less supply-constrained world. This means more influence of the 4Cs of consumer demand — confidence, composition (including the sharing economy), clarity (including digital age shopping) and capacity. For more about PIPE Factors and 4Cs, please see “European Central Bank can’t flight Minecraft,” February 2015. Consumers looking at their shopping carts know this is not new. It started over 3 decades ago. By 1997, the rip tide pattern was clear. This suggests low pre-crash inflation was not due to “well anchored” inflation expectations, but because shoppers – like a swimmer in the surf — felt the reality of the rip tide split in prices. 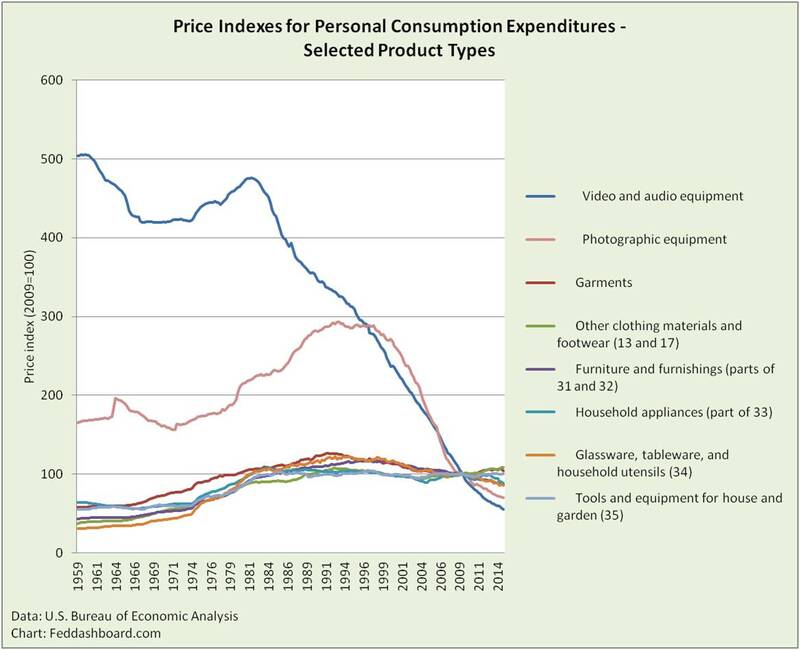 Consumer goods are healthy compared to trends since 1992. Services have been weakening for decades, somewhat explained by structural shifts.